Not to be confused with the National Front for Liberation–Tahrir al-Sham conflict of 2019. Tahrir al-Sham was formed by five Salafist rebel groups in Syria, including the al-Nusra Front and the Nour al-Din al-Zenki Movement, on 28 January 2017. During clashes between Tahrir al-Sham and Ahrar al-Sham, however, Nour al-Din al-Zenki refused to fight Ahrar al-Sham and defected from HTS. Violent clashes then erupted between Zenki and HTS in western Aleppo and northern Idlib between August and November 2017. On 18 February 2018, Ahrar al-Sham and the Nour al-Din al-Zenki Movement announced a merger which established the Syrian Liberation Front. According to Sam Heller of the International Crisis Group, the formation of the Syrian Liberation Front was an attempt by Ahrar al-Sham and the Zenki Movement to create a "counterweight" against the dominance of Tahrir al-Sham in northwestern Syria. HTS reportedly prepared to attack Zenki prior to the merger. Tahrir al-Sham released a statement condemning Nour al-Din al-Zenki Movement and calling them 'aggressors' and liars about their willingness to resolve inter-rebel disputes in a Sharia court as well as calling them traitors, the statement also said this is part of a long series of conflicts with the Zenki movement and listed several incidents of times the Zenki movement acted against Tahrir Al-Sham. Allegations included recruiting former Syrian Democratic Forces and YPG fighters to fight Tahrir al-Sham as well as attacks on bases belonging to Tahrir al-Sham. The statement also said that the Zenki movement planted IEDs and attempted to assassinate Tahrir Al-Sham members via this method, and that they are responsible for killing a Tahrir Al-Sham official named Abu Ayman Al-Masri after attacking a court house, a child, and a teacher from a religious college. The statement also said that the Zenki movement is being hypocritical regarding affairs in Idlib and the siege in East Ghouta by not sending fighters to Ghouta but rather deploying them to attack Tahrir al-Sham, they also condemned the Zenki movement for their support of de-escalation zones. Ahrar al-Sham also released a statement about their support for the Nour al-Din al-Zenki Movement and plans to expel Tahrir al-Sham from the area. Observers have said that the conflict is possibly being used by Turkey as an opportunity to expand influence over the area with groups aligned with Turkish interests in the area whilst liquidating hard-line groups such as HTS and Al-Qaeda. The conflict was triggered by the assassination of HTS commander Abu Ayman al-Masri on 16 February 2018, by Nour al-Din al-Zenki. The commander's wife was also wounded during the attack that killed him. On 19 February 2018, a day after the Syrian Liberation Front was established, clashes erupted between the SLF and HTS in western Aleppo and northern Idlib. By 21 February, the SLF, with support from Suqour al-Sham, captured the city of Maarrat al-Nu'man, the towns of Ariha and Tramla, and the Wadi Deif military base near Maarrat al-Nu'man following HTS withdrawal. Meanwhile, in western Aleppo, HTS captured the villages of Kafr Laha, Basratun, Uwayjil and Taqad from the SLF. On social media, both groups accused each other of spreading fake news. HTS's official media outlet claimed on Telegram that "There are no problems between us and Ahrar al-Sham", and that Ahrar al-Sham fighters assisting the Nour al-Din al-Zenki Movement are "nothing more than individuals whose motivations are clear." This was said despite Ahrar al-Sham as a whole merging with the Nour al-Din al-Zenki Movement in forming the Syrian Liberation Front. On 20 February the Syrian Liberation Front accused Tahrir al-Sham of capturing its members at checkpoints. On 24 February, Hassan Soufan, general commander of the Syrian Liberation Front, called on the Sham Legion, who did not comment on the clashes, to side with the SLF against HTS. During a brief battle on 26 February, mere hours after the loss of Darat Izza to the SLF, HTS reportedly captured the largest base of Ahrar al-Sham, Khirbet Bantanta Military Camp, located in northern Idlib province, thus securing a large stash of weaponry, including 20 tanks, towed artillery pieces, multiple rocket launchers, self-propelled guns and infantry fighting vehicles. On 27 February, HTS withdrew from the city of Khan Shaykhun, and was expelled from western Aleppo, although it repelled the SLF advance on al-Dana. During the last day of February, HTS launched a large-scale counter-offensive, capturing settlements of Kafr Losen, Aqrabat, Deir Hassan, and Qah, as well as attacking the town of Atmeh. HTS also handed over Morek to the Army of Glory and the SLF. On 2 March, Tahrir al-Sham advanced to the outskirts of the SLF stronghold of Atarib with an estimated 1,500 fighters and 30 tanks, along with other vehicles. However, Tahrir al-Sham fighters retreated from their staging positions after dozens of civilians demonstrated against the attack on Atarib. The head of Atarib's local council stated that they have reached an agreement with Tahrir al-Sham, which stated that the group will not enter Atarib. Multiple factions operating in Atarib, including the Atarib Martyrs Brigade, the Sham Legion, and Ahrar al-Sham, formed a unified military formation named the Revolutionaries of Atarib, consisting of over a thousand of fighters. The new formation stated that its goal is to protect Atarib from any aggressor. In Idlib, Abdullah al-Muhaysini and Musallah al-Olayan announced the formation of the Aba Union for foreign jihadist fighters to remain focused on fighting the Syrian government and not get involved in the infighting while still remaining in their respective factions. As Atarib was surrounded on all sides by HTS, HTS has also announced plans to take Darat Izza and the Aleppo suburbs by force. [better source needed] The next day, the SLF took control of three in northern Aleppo and northwest Idlib, near Afrin. Hussam Atrash the head of the SLF political bureau posted on Twitter threats of further violence against HTS. Several tribal forces are to be deployed to Idlib from Turkey after clan leaders in Urfa had a meeting with Turkish President Recep Tayyip Erdogan to discuss the framework and development of a council. The tribal fighters are being sent to Idlib on an unspecified date to support the Turkish military operation in Afrin in an interview a representative from the tribal fighters was asked about the situation in Idlib to which he said “we were asked to be ready to go there (Idlib)" he added, ”If there is an internal order to fight HTS, we will participate”. On 3 March, the SLF (specifically the Nour al-Din al-Zenki) took advantage of HTS forces being off-balance. Attacked west of Kafr Nabl, the SLF captured three towns along a road, further isolating HTS garrisons in southern Idlib governorate.Template:Better link A media channel linked to SLF and Suqour al-Sham claimed the killing of 3 HTS commanders in Jabal Zawiya. On 23 March, Tahrir al-Sham clashed with SLF in the western part of the Aleppo Governorate, 100 people gathered to demonstrate against Tahrir al-Sham in Atarib near the headquarters of Tahrir al-Sham and they opened fire on the demonstrators injuring one while they shelled the 46th regiment base. On the same day unknown gunmen stormed the headquarters of the Sham Legion in Idlib killing four of their members there is evidence that suggests that Jund al-Aqsa is behind the attack which has cells and remnants active in Tahrir al-Sham, Guardians of the Religion organization, the Turkistan Islamic Party, as well as a new group consisting of 300 former members of the group called Ansar al-Tawhid. [better source needed] Turkish President Recep Tayyip Erdogan told US President Donald Trump and Russian President Vladimir Putin that after the military operation in Afrin is complete that his next goal is to take both Idlib and Manbij. On 1 April, another cease-fire was mediated by the Sham Legion and several scholars, the cease-fire also included Suqour al-Sham and began at 6:00pm Syrian time. [better source needed] On 2 April, fighting resumed between SLF and HTS, SLF accused HTS of detaining members of a delegate that were supposed to meet with a delegation from HTS. On 9 April, There was an explosion in the vicinity of the Al-Rahman mosque in a neighborhood of Idlib. At least ten civilians were killed and more than 50 were wounded by the explosion;[better source needed] the perpetrators are unknown. On 15 April, Tahrir al-Sham launched a massive offensive against the Syrian Liberation Front and Suqour al-Sham in the southern part of the Idlib Governorate, capturing several towns and villages, the SLF and Suqour al-Sham were able to repel an attack on Maarat al-Numaan and there are unconfirmed reports that they also retook Khan Shaykhun and Murak. Since the start of the conflict in February, at least 196 members of Hay'at Tahrir al-Sham and 148 members of Jabhat Tahrir Souriya have been killed in southern Idlib and western Aleppo provinces, according to SOHR, amidst heavy clashes between the dominant opposition groups. By 18 April, casualties in Idlib since the start of fighting on 18 February (according to pro-rebel media) had reached 750 HTS fighters killed, 225 SLF fighters killed, and 3,000 fighters on both sides wounded. 10 tanks and five other armored vehicles were also destroyed. On 24 April, both groups signed another cease fire agreement, agreeing to end all aggression, the leaders of both groups Soufan and Joulani both signed the agreement. On 27 April, after a mass assassination campaign against multiple opposition groups in Idlib began, an IED was targeted Saudi cleric Abdullah al-Muhaysini near Saraqib after he was leaving a meeting to mediate a prisoner exchange between HTS and SLF. On the same day another IED exploded on a road near the village of Bir al-Tayib killing 4 civilians and injuring 2. The Syrian Salvation Government declared a state of emergency in Idlib. [better source needed] On 29 April, the assassinations for the 4th continued day, with the killing of 2 Hayyaat Tahrir Al-Sham members and a lieutenant from the SAA who defected, by an IED. According to the SOHR over 30 people have died in selective assassinations after the ceasefire took place. In January 2019, HTS seized control of dozens of villages from Nour al-Din al-Zenki, forcing National Front for Liberation to sign a ceasefire deal. . HTS seized control of Idlib province on January 10 right after the ceasefire. ^ a b "Syrian War Daily – 21st of February 2018". Syrian War Daily. 21 February 2018. ^ a b "Al-Zenki, Ahrar Al-Sham and Suqour Al-Sham continue their advancement in Idlib countryside at the expense of Tahrir Al-Sham and the fighting between them rages the resentment of the residents of Aleppo and Idlib". Syrian Observatory for Human Rights. 22 February 2018. ^ "New faction joins Jihadist infighting in northern Syria". Al-Masdar News. 1 March 2018. ^ "Hay'at Tahrir al-Sham Captures Key Base In Western Aleppo From SLF". South Front. 1 March 2018. ^ "After ten days of clashes in Idlib, Hizb Turkistani helps HTS retakes initiative in the province". Aleppo24. 3 March 2018. ^ a b c d e Waleed Khaled a-Noufal; Tariq Adely (22 February 2018). "Two of the largest factions in Syria's northwest merge, challenge HTS dominance". Syria Direct. ^ "After its successive withdrawals, Hayyaat Tahrir al-Sham continues its counteroffensive and restores at least 23 areas in Idlib countryside and west of Aleppo". SOHR. 1 March 2018. ^ a b "Breaking: Nusra recaptures 50 towns in Idlib and Aleppo from rival Islamist militia amid huge counter-offensive – Map update". Al-Masdar News. 3 March 2018. ^ a b "Fighting of the major factions in the west of Aleppo and the countryside of Idlib continue with attempts of advancement between both parties". Syrian Observatory for Human Rights. 24 February 2018. ^ "Clashes continue in the abolition war between Hayyaat Tahrir al-Sham and factions working in the Syrian north". SOHR. 1 March 2018. ^ a b "صوفان يدعو "فيلق الشام" للدخول ضد "تحرير الشام" في إدلب للمزيد". Enab Baladi. 24 February 2018. ^ a b "Syrian War Daily – 27th of March 2018". Syrian War Daily. 28 March 2018. ^ a b سوريا, شبكة نداء. "#عاجل ll مصادر إعلامية تابعة لجبهة تحرير سوريا وصقور الشام تؤكد مقتل القياديين في هيئة تحرير الشام" أبو عهد طقيقة" و " أبو أويس المغربي" وأسر الأمني في سجن العقاب " أبو اليمان الأنصاري" خلال معارك اليوم بين الطرفين في منطقة جبل الزاوية بإدلب. #نداء_سوريا #سوريا". Twitter. Retrieved 7 March 2018. ^ "Syrian War Daily – 12th of March 2018". Syrian War Daily. 12 March 2018. Retrieved 20 March 2018. ^ a b "Syrian War Daily – 2nd of March 2018". Syrian War Daily. 2 March 2018. ^ a b c "After the death of more than 430 civilians and fighters in 64 days, the factions fighting each others within the abolition war reach a "final" agreement in Idlib and Aleppo". SOHR. ^ a b c "60 يوماً من المواجهات بين "هيئة تحرير الشام" و "تحرير سوريا" و "صقور الشام" .. ومصدر يكشف عدداً صادماً لقتلى الطرفين". Syria News. 18 April 2018. ^ a b "HTS and JTS sign agreement to stop the fight indefinitely and have reached a ceasefire to stop all agression [sic]. Ceasefire is signed by Abu Mohammad al Julani and Hassan Soufan - Map of Syrian Civil War - Syria news today - syria.liveuamap.com". Map of Syrian Civil War - Syria news today - syria.liveuamap.com. ^ Joscelyn, Thomas (28 January 2017). "Al Qaeda and allies announce 'new entity' in Syria". Long War Journal. Foundation for Defense of Democracies. ^ Waleed Khaled a-Noufal; Tariq Adely (20 July 2017). "Nour e-Din a-Zinki defects from HTS, citing unwillingness to end rebel infighting". Syria Direct. ^ "Relations between Hai'yat Tahrir al-Sham and Nour al-Din al-Zinki in 2017" (PDF). Carter Center. 7 November 2017. ^ "Hardline Syria rebels announce merger". Agence France-Presse. 19 February 2018. ^ Stork. "Ahrar al-Sham joined al-Zanki to confront HTS, expelled HTS from several towns and positions in Idlib and Hamapic.twitter.com/Z0tpoNyhmj". Twitter. ^ "Where is al-Qaeda in Syria?". Al Jazeera. ^ Mroue, Bassem (14 March 2018). "Al-Qaida in Syria losing ground in battles with insurgents". Associated Press. Retrieved 20 March 2018. ^ "Top militant commander killed by rival Syria rebels: monitor". Agence France Presse. 16 February 2018. Retrieved 20 March 2018. ^ Osman, Tamer (28 February 2018). "Syrian Islamist factions join forces against Hayat Tahrir al-Sham". Al Monitor. ^ "HTS captures largest Ahrar Al-Sham military camp in northern Syria". AMN - Al-Masdar News | المصدر نيوز. 26 February 2018. Retrieved 26 February 2018. ^ "HTS withdraws from key city in southern Idlib". Al Masdar News. 27 February 2018. 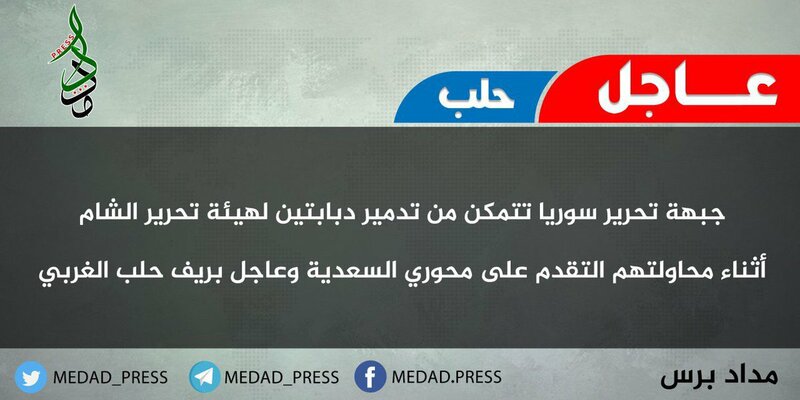 ^ "Breaking: HTS officially expelled from western Aleppo". Al Masdar News. 27 February 2018. ^ "HTS foils big assault by Jabhat Tahrir Souriya in northern Idlib". AMN - Al-Masdar News | المصدر نيوز. 28 February 2018. Retrieved 28 February 2018. ^ "HTS launches massive counter-offensive in northern Syria". AMN - Al-Masdar News | المصدر نيوز. 28 February 2018. Retrieved 28 February 2018. ^ "HTS advance in Aleppo and Idlib countryside and release ISIS captured fighters to fight against "Jabhet Tahrir Syria"". Northern Syria Observer. ^ "Syrian War Daily – 1st of March 2018". Syrian War Daily. 1 March 2018. ^ "Idlib Rebel Civil War – 2/3/18". Syrian War Daily. 3 March 2018. Retrieved 7 March 2018. ^ أطرش, حسام ابراهيم. "ليلة سوداء ستمر على العلج الجولاني، لم تبدأ بعد المعركة الحقيقة، فكل ما حصل ليس إلا تمهيد،". Twitter. Retrieved 7 March 2018. ^ "مصدر: قوات عشائرية تتجهز للتوجه نحو إدلب - عنب بلدي". Enab Baladi. 2 March 2018. Retrieved 7 March 2018. ^ "#Syria- Tribal Army to Idlib soon via #enabBaladi". YallaSouriya. 2 March 2018. Retrieved 7 March 2018. ^ "Idlib Rebel Civil War – 3/3/18". Syrian War Daily. 4 March 2018. Retrieved 7 March 2018. ^ "Breaking: Nusra recaptures 50 towns in Idlib and Aleppo from rival Islamist militia amid huge counter-offensive - Map update". Al Masdar News. 3 March 2018. Retrieved 7 March 2018. ^ "Syrian War Daily – 4th of March 2018". Syrian War Daily. 4 March 2018. Retrieved 7 March 2018. ^ "Syrian War Daily – 7th of March 2018". Syrian War Daily. 7 March 2018. Retrieved 20 March 2018. ^ "Hay'at Tahrir al-Sham Captures More Villages From Syrian Liberation Front Despite Calls For Reconciliation". SouthFront blog. 7 March 2018. Retrieved 10 March 2018. ^ Idlib24. "تنظيم "هتش" يفرج عن نحو 50 عنصر من تنظيم "جند الأقصى" كانوا محتجزين بأحد السجون التابعة للتنظيم في مدينة إدلب. #إدلب24 #إ24". Twitter. Retrieved 20 March 2018. ^ "Hay'at Tahrir al-Sham And Syrian Liberation Front Reach 48 Hours-Long Ceasefire Agreement In Idlib". Twitter. 9 March 2018. Retrieved 10 March 2018. ^ "Syrian War Daily – 11th of March 2018". Syrian War Daily. 11 March 2018. Retrieved 20 March 2018. ^ "Syrian War Daily – 17th of March 2018". Syrian War Daily. 17 March 2018. Retrieved 20 March 2018. ^ "Syrian War Daily – 19th of March 2018". Syrian War Daily. 19 March 2018. ^ "Syrian War Daily – 22nd of March 2018". Syrian War Daily. 22 March 2018. ^ "Syrian War Daily – 23rd of March 2018". Syrian War Daily. 23 March 2018. Retrieved 26 March 2018. ^ "I told Putin and Trump we won't step back in Syria: Erdoğan". Hürriyet Daily News. Retrieved 26 March 2018. ^ Şafak, Yeni. "Idlib, Manbij to follow Turkey's Afrin op, says Erdoğan". Yeni Şafak. Retrieved 26 March 2018. ^ Şafak, Yeni. "Car bombing kills seven in Syria's Idlib". Yeni Şafak. Retrieved 26 March 2018. ^ "Syrian War Daily – 24th of March 2018". Syrian War Daily. 24 March 2018. Retrieved 26 March 2018. ^ "Idlib Rebel Civil War – 3/26/18". Syrian War Daily. 27 March 2018. ^ "Syrian War Daily – 28th of March 2018". Syrian War Daily. 28 March 2018. ^ "Syrian War Daily – 29th of March 2018". Syrian War Daily. 29 March 2018. ^ "Syrian War Daily – 30th of March 2018". Syrian War Daily. 30 March 2018. ^ "Syrian War Daily – 31st of March 2018". Syrian War Daily. 31 March 2018. ^ "Syrian War Daily – 1st of April 2018". Syrian War Daily. 1 April 2018. ^ "Syrian War Daily – 2nd of April 2018". Syrian War Daily. 2 April 2018. ^ "Syrian War Daily – 4th of April 2018". Syrian War Daily. 4 April 2018. ^ "Syrian War Daily – 7th of April 2018". Syrian War Daily. 7 April 2018. ^ "Syrian War Daily – 9th of April 2018". Syrian War Daily. 9 April 2018. ^ "Nusra Front hunts down Jaysh al-Islam militants in Idlib". al-Masdar News. 11 April 2018. ^ "Syrian War Daily – 12th of April 2018". Syrian War Daily. 12 April 2018. ^ "Syrian War Daily – 15th of April 2018". Al Masdar News. 15 April 2018. ^ "All out war breaks out between rival jihadist groups in southern Idlib". Al Masdar News. 15 April 2018. ^ "After the death of hundreds of citizens and fighters… Hayyaat Tahrir al-Sham continues its new round within the abolition war and takes the control of a crossing connected to the regime's controlled areas". Syria HR. ^ "Jihadist civil war proves costly as 340+ militants killed last weekend: monitor". AMN - Al-Masdar News | المصدر نيوز. 16 April 2018. Retrieved 16 April 2018. ^ "Syrian War Daily – 16th of April 2018". Syrian War Daily. 16 April 2018. ^ "Syrian War Daily – 19th of April 2018". Syrian War Daily. 19 April 2018. ^ ~ Joško Barić (26 April 2018). "– 26th of April 2018". Syrian War Daily. Retrieved 30 April 2018. ^ ~ Joško Barić (26 April 2018). "– 27th of April 2018". Syrian War Daily. Retrieved 30 April 2018.